In Lao PDR, more than 860,000 hectares of land are devoted to rice production, of which 760,951 hectares (88%) are composed of rainfed lowland rice. However, the rice industry experiences losses because of frequent floods that damage rice fields in the central region (10–29%) and across the country (8–21%). Floods usually occur from late August to late September. The country is prone to drought, which damages and reduces yield from 10% to 50% in the central parts of the country. Drought occurs at any time during the growing season, with early drought in June to July, intermittent drought happening from August to September, and late drought in October. 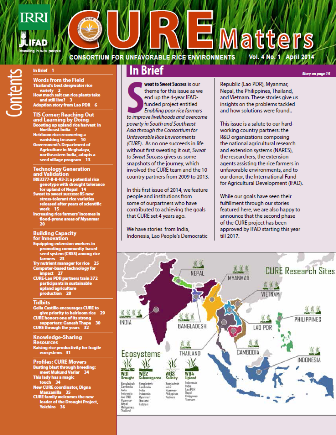 These chronic problems of floods and droughts have prompted partners of CURE, led by Lao’s Agriculture Research Center (ARC), to showcase how to grow submergence- and drought-tolerant rice varieties grown using best management practices to farmers. The research team aimed to promote these improved varieties to increase rice productivity in flood-prone areas. During the 2015 wet season, 22 new aromatic rice varieties with traits that can withstand flood and drought were planted in a field trial at ARC. On the other hand, 19 aromatic, drought-, and flood-tolerant rice varieties were tested at the Xebangfai Agriculture Research and Development Center (XBFC). Results from ARC showed that grain yield of the new aromatic, flood-, and drought-tolerant varieties ranged from 3.6 tons per hectare to 4.5 tons per hectare. Nine varieties outyielded the check variety, of which six produced 4.3–4.5 tons per hectare. Four new varieties with good eating quality were then produced in the 2015-16 dry season, and their seeds will be provided to farmers to test in the 2016 wet season. Meanwhile, the varieties tested at XBFC yielded from 2 tons per hectare to 3.6 tons per hectare. Three aromatic varieties had higher yields than two commercial check varieties, although the differences were not significant. The seeds of four chosen varieties (three aromatic and one flood- and drought-tolerant variety) are now being produced at the Center. A high-quality harvest of improved rice varieties can only be fully reached if they are planted using best management practices. Thus, rice varieties that can survive floods were planted using best management practices and highlighted in field demonstration trials in eight villages from four districts. These were located in the provinces of Vientiane, Bolikhamxai, Khammouan, and Savannakhet. Fifty-five farmers participated in the demonstration trials for them to observe and compare the differences in the varieties and familiarize themselves with applying best management practices. The grain yield of all the tested improved varieties was higher than that of the local varieties. At all eight sites, farmers who used certified seed had a 2–79% increase in yield. The increase in yield varied depending on the conditions in the fields. For example, the yield gap was high between XBF1, a flood-tolerant variety, and local farmers’ varieties in Nakua Nok Village because the rice field was completely flooded for 7 days. Thus, the yield of the farmers’ varieties was much lower than that of XBF1. And since the farmers did not undergo any training on rice seed production, the seeds that they used were of poor quality. On the contrary, the yield gap was small between the flood-tolerant variety and local farmers’ varieties at sites where farmers attended training courses on rice seed production provided by government agencies and international and national nongovernment organizations (NGOs). Rice seed production in Lao PDR can be classified into formal and informal seed production systems. The formal seed production system starts from breeder seed to foundation seed, to registered seed, and, finally, certified seed. Breeder and foundation seeds are produced by ARC and the National Agriculture Forestry and Research Institute, while the certified seed is produced by state centers, private seed companies, and farmer seed groups. However, certified seed produced by these three groups covers only 12% of the total amount of seed needed for rice production in the country (51,807 tons). Certified seeds are usually sold to farmers’ groups that produce paddy for rice millers’ associations to process and export. On the other hand, in the informal seed production system, good seed is produced by farmers who have been trained by international research institutes and NGOs, under the supervision of Lao’s Ministry of Agriculture and Forestry. This approach provides 19% of the country’s required seed. 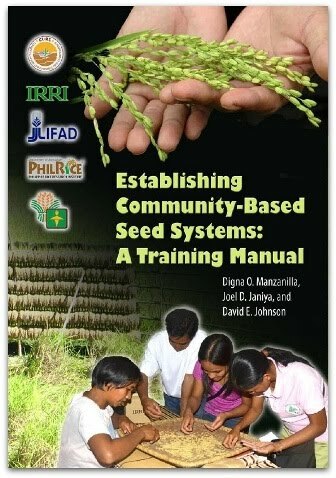 In the informal system, farmers can also produce seeds by themselves using their own knowledge and techniques, which accounts for 69% of the country’s required amount of rice seeds. These two types of seed provide paddy for the local market and food security for the country. However, seeds produced by farmers are usually of low quality and do not meet standards. Furthermore, farmers’ seeds are not of uniform quality, so the quality of paddy is poor, which in turn leads to low milling and eating quality. The Lao CURE team promotes climate-smart rice varieties for farmers to produce in unfavorable rice environments such as flood-prone plains. In the 2015 wet season, breeder and foundation seeds of three flood-tolerant varieties (XBF1, HXBF2, and HXFB3) were produced by ARC and XBFC. These varieties are now being promoted to farmers. XBFC produced 1,000 kilograms each of registered seeds of varieties XBF1 and XBF2, which were then sold to a farmer seed production group for it to produce certified seeds. The seed production group then produced and sold 6,000 kilograms of the certified XBF2 seed to farmers and a private company to produce paddy in the 2015-16 dry season. Unfortunately, low-quality farmer-produced seeds still provide the majority of the total seed needed by the country for rice production. Thus, training on proper rice seed production is crucial. More Lao farmers should be able to produce good quality seed to increase rice production and ensure food security. To boost the quality of rice for export in the regional and international market, the Lao CURE team believes that all components should work together harmoniously. In their proposed scheme, research centers will produce breeder and foundation seeds while farmer seed groups will focus on certified seed production. Farmers’ associations will then produce paddy using certified seed and rice millers will need to develop standards for buying paddy from certified seed. In this scheme, it is crucial that the government support all the actors. In the meantime, CURE and its Lao partners continue to develop rice varieties that can withstand flood and drought, and produce top-quality seeds for farmers, to be able to increase rice production and improve livelihoods in the flood-prone plains. This story was originally published in CURE Matters Vol. 6, No.1.